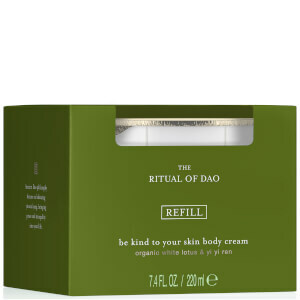 Feel perfectly pampered with Rituals The Ritual of Dao Body Cream; a lightweight, quick-absorbing formula with a delicate fragrance of White Lotus. Harnessing the powers of Shea Butter, Centella Asiatica and Yi Yi Ren (an ingredient traditionally used in Chinese medicine), the rich, creamy moisturiser softens and conditions skin without greasy or sticky residue. 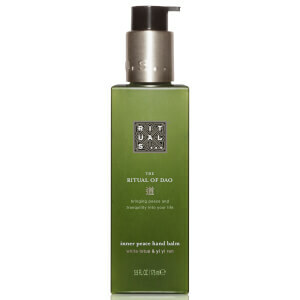 Expect smooth, supple and comfortable skin from top to toe. Aplique todos os dias na pele e massaje todo o corpo. Aqua/Water, Cyclopentasiloxane, Cetearyl Alcohol, Glycerin, Dicaprylyl Ether, Dimethicone, Butyrospermum Parkii (Shea) Butter, Pentaerythrityl Distearate, Helianthus Annuus (Sunflower) Hybrid Oil, Isopropyl Palmitate, Tocopheryl Acetate, Tocopherol, Sodium Hydroxide, Butylene Glycol, Ubiquinone, Centella Asiatica Leaf Extract, Coix Lacryma-Jobi (Ma-Yuen) Seed Extract, Nelumbo Nucifera Flower Extract, Theobroma Cacao (Cocoa) Seed Butter, Caprylic/Capric Triglyceride, Olus Oil (Vegetable Oil), Helianthus Annuus (Sunflower) Seed Oil, Parfum/Fragrance, Sodium Stearoyl Glutamate, Acrylates/C10-30 Alkyl Acrylate Crosspolymer, Xanthan Gum, Polyglyceryl-2 Dipolyhydroxystearate, Phenoxyethanol, Caprylyl Glycol, Potassium Sorbate, Benzyl Alcohol, Benzyl Salicylate, Butylphenyl Methylpropional, Hexyl Cinnamal, Linalool, Alpha-Isomethyl Ionone.